THE crunch of rock meeting metal rebounds through the cabin as we drop off a metre-high ledge. Impacts like that are typically chassis-cracking, yet the Jeep Wrangler Rubicon doesn't flinch. We do that on its behalf, then wince at the squeal of scraping skid pans as the four-wheel drive resolutely inches its way along the infamous Rubicon Trail. The boulder-strewn track traverses 35km of the rugged Sierra Nevada region on California's eastern fringe. 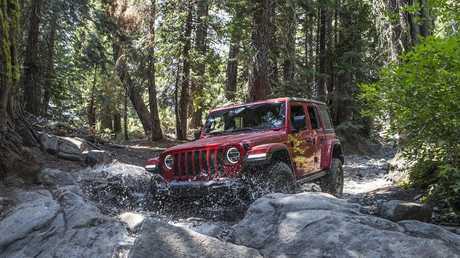 It is a rite of passage for all trail-rated Jeep Wranglers to assess their ability to clamber over obstacles that would leave most 4WD vehicles dripping fluids. Mean machine: The Wranbgler Rubicon is more than capable off-road. The Rubicon variant of the new JL Wrangler is an absolute machine in this environment, whether in two or four-door guise. Evidence of Jeep's faith in its ability is the fact 24 motoring journalists - many with minimal off-road experience - are crawling along the route. The stats are insane: 280mm of ground clearance, an approach angle of 44 degrees, break-over angle of 27.8 degrees (22 degrees for four-door versions), departure angle of 37 degrees, wading depth of 760mm and a crawl ratio of 77.2:1 (the previous model made do with 59:1), coupled to locking front and rear diffs and electronic sway-bar disconnect. 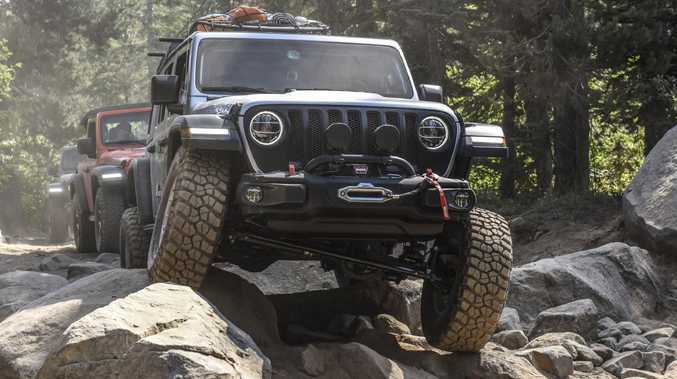 With standard underbody bash plates, side rock rails and steel front and rear bumpers, the Wrangler Rubicon is purpose-built to negotiate the massive granite steps and exposed tree roots we encounter every few metres. Body armour: The Rubicon is protected by underbody bash plates and side rock rails. Our run covers about half of the trail. It's the easy half, though easy is a relative term when you encounter Cadillac Hill, named after the rusting panels of a Caddy that plunged down the slope more than 80 years ago when the trail was a maintained road leading to a hotel at Rubicon Springs. For the first new Wrangler in 11 years, Jeep has focused on extending its capability on the bitumen and in the bush - and it has succeeded. 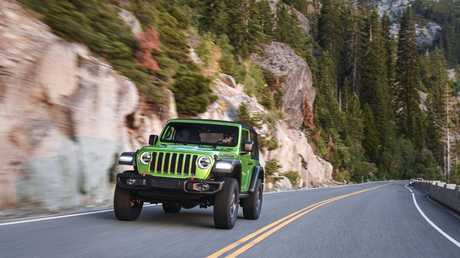 The ladder-frame chassis and live axles have been retained, though the Wrangler is now lighter, more aerodynamic (the kink in the grille sloping back to the bonnet helps with a 9 per cent improvement in aero) and more fuel-efficient. 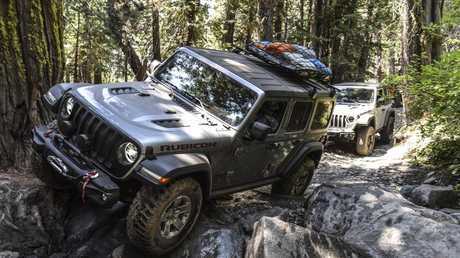 Steep decline: The 2019 Jeep Wrangler Rubicon has a departure angle of 37 degrees. 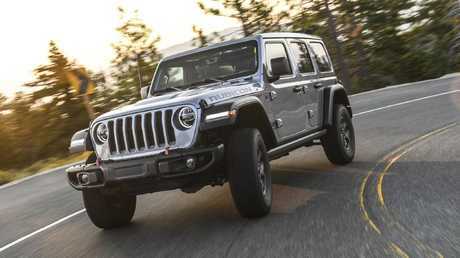 The JL Wrangler is due in Australian dealerships early next year and while there's no official announcement on which engines and transmissions we'll get, local engine options are tipped to be an updated 3.6-litre V6 or new 2.2-litre four-cylinder turbo diesel, both exclusively powered by an eight-speed auto. In the US, engine options are a 2.0-litre four-cylinder turbo and a 3.0-litre V6 turbo diesel. 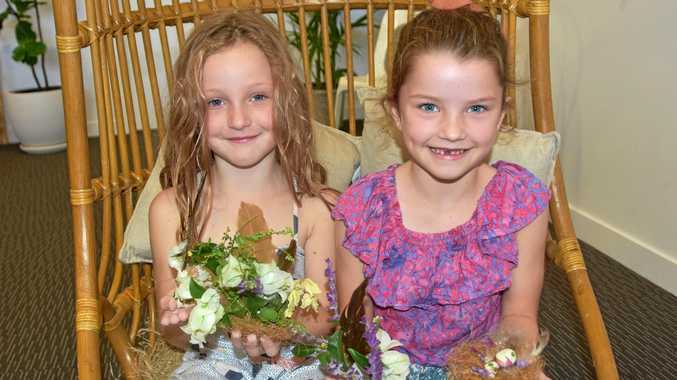 They would add to the price and are not likely for Australia. Equally, the six-speed manual isn't expected to be on the table for right-hand drive variants. The UK is keener than Australia to get three-pedal vehicles but will miss out. Chief engineer Brian Leys offered a "right" when queried whether that restriction applied to Australia. Make of that what you will - noncommittal or affirmative. 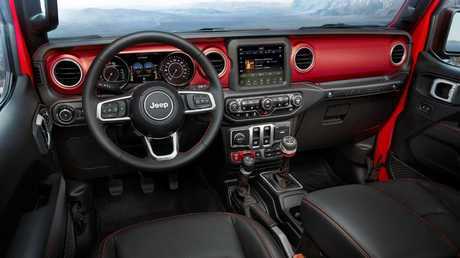 Mod-cons: The Wrangler’s interior has been brought into the 21st century. Fiat Chrysler Asia-Pacific boss Steve Zanlunghi is aiming for all Wranglers to adopt autonomous emergency braking and blind-spot monitoring, which will keep ANCAP happy. I've driven light trucks with better bitumen behaviour than the outgoing JK Wrangler, which would wander around in its lane as soon as it encountered camber or even a strip of rubberised road sealant. Constant small steering adjustments were required to keep it toeing the line and that quickly becomes tiring and tiresome on longer journeys. Big improver: The new Jeep Wrangler is far better to drive on the bitumen than the previous iteration. The electro-mechanical steering on the new model goes a long way towards fixing the problem without rivalling a soft-roader SUV. The steering is more direct just off centre and the tendency to wander in the lane has been dialled well down, especially considering the Rubicon rides on 32-inch tyres. Sealant, road joins and small dips still transmit back into the cabin but bigger lumps are simply ironed out as the suspension starts to travel. That's an acceptable compromise when you consider how adept the Wrangler is as soon as you turn up a dirt road. If you are serious about tackling the great outdoors, we'd recommend the Mopar 5cm suspension lift kit using Fox dampers. High-rider: The Rubicon rides on 32-inch tyres. Jeep Australia has yet to set a price for this accessory but it costs $US1500 plus installation in North America; we're guessing it will come to about $2500. If not, buy it online and ship it here for about $225. The interior packaging includes an 8.4-inch infotainment screen with smartphone mirroring.